Carmen, Adam, and Jeff address a few methods by which engineers can track, organize, and prioritize the tasks for which they are responsible. Jeff admits that he often struggles more with deciding what to do than with getting something done. Even though Chris is not with us this week, we reference once of his favorite books, “The Dip,” by Seth Godin. On a recent weekend, Jeff got the chance to meet listener Ioannis Andrianakis, founder and technical director of Plex Tuning. Phone calls are dead, except for those who believe that phone calls aren’t dead. To-do lists have been around for a long while, although not everybody is a fan. One variation on the todo list, the 1-3-5 rule, suggests writing down one big task, three medium-sized tasks, and five little tasks to accomplish during the day. Another scheme for improving todo lists is the Auto Focus system, created by Mark Forster. A book titled “The Progress Principle” contends that managers should ensure their employees achieve steady forward progress in meaningful work. Jeff has reviewed the book elsewhere. One of the best-known productivity systems is the Getting Things Done (GTD) method, outlined in a book of the same name that was authored by David Allen (and not Paul Allen as stated in the podcast). Capture everything on your mind. Clarify the meaning of each task. Reflect on your progress and process. Engage in getting tasks completed. An extensive review of the GTD method can be found in Episodes 95, 96, and 97 of the Back to Work podcast by Merlin Mann and Dan Benjamin. At one point Jeff used the Franklin Planner system for staying organized at work. The Pomodoro Technique is a means for improving one’s time management. Many apps are available for implementing the Pomodoro method. An analog note-taking system for staying organized is the Bullet Journal. Jeff is currently using Nozbe for keeping track of his “To Do” items. Most people dislike being told what to do. Carmen recently came across an article about the power of checklists. Kanban is a method for controlling inventory flow within a production facility. Personal Kanban is a means for completing one’s tasks without getting too overloaded. 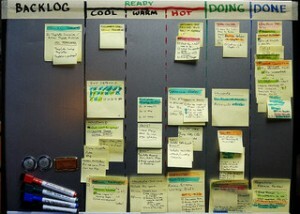 A whiteboard is often used to implement Personal Kanban. The Trello web app can be used for implementing Personal Kanban in a digital manner. Demetri Martin described his implementation of DBTC in an old episode of the Nerdist podcast. Evernote, Dropbox, and Google Drive provide useful tools for storing information on the web. Jeff uses pocket-sized Moleskine Cahier notebooks for jotting down information during the day. Carmen prefers the memo books from Field Notes. Adam uses an Excel file for tracking tasks, and prints out a copy of the spreadsheet to carry with him when he is away from his desk. Windows users can use Notepad to track activities, generating timestamps by pressing the F5 key. Thanks to Dennis Hamilton for use of the photo titled “Productivity: Wrapping up the First Stage of a Special Project.” Podcast theme music by Paul Stevenson.